In far off Dubai, where human engineering has converted deserts into vast golf resorts, ski slopes with real snow, and enormous glittering towers, another debt crisis has for some days threatened to unravel parts of the byzantine infrastructure of world finance. “This is punishment day. Why didn’t we sell last week? This is punishment for the unexpected news from Dubai World last week.” Thus the lament of a trader in Dubai. The uncertainty is palpable. Dubai World has some characteristics of a sovereign wealth fund, meaning an enterprise run like a high-finance satrapy of the state. In any case it far from a truly private enterprise. Meanwhile, it appears from reports that the biggest banks exposed to the disputed debt and other aspects of the Dubai enterprise, are regional, European and UK banks that, due to the recent usury crisis, now have some characteristics of sovereign wealth funds. So we have, as it were, a quasi-state holding company in a staredown over some of its debt with its foreign creditors, many of which are quasi-state banking conglomerates. Now, one of the lessons of the past 18 months is that these distant rumors of far-off finance machination gone bad cannot be safely ignored. Much as we might want to leave the capital structure of Gulf State holding companies to the financiers and their engineered devices, the financiers will not return the favor. Readers may recall that in 2008 such far off detonations triggered ruin and bankruptcy across the world. Giant insurance companies, industrial behemoths, small towns in Australia, whole nations — they were all, in various ways, shown to be subject to the machinations of high finance. Put another way, despite the decades-long preachment that integration of world capital markets — in a word Globalization — would engender stability, in fact very nearly the reverse has proven true. Globalization has issued in extraordinary fragility. Under stress, the fragile architecture of debt finance disintegrated, necessitating government intervention. We have the “stability” of socialized risk; the “stability” of servility. A nice pickle we’ve landed ourselves in. The defect that allowed this, in my view, lies very deep within us. It would be nice if we could pretend that it is localized in the financier-class, or if we could safely shelve it under the familiar category of the folly of governmental intervention into the private economy. Alas, the rot goes deeper than that. In a sense it lies in the modern project itself. It comes down to the old heresy that human life and the world can be captured by models and equations and abstractions, that the science of man can conquer the uncertainty of the world. The very idea of progress must be re-examined in light of what we have seen. Our technical mastery has deluded us. Our assumptions are undone. The financial crisis, the Great Recession, the crisis of usury: they are at root mere evidences of the failure of the modern mind. And this failure is shared by virtually every class of Americans. 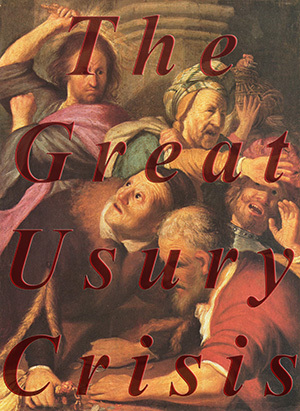 We the People of the United State have embraced usury. It is idle to blame the bankers and spare the American democracy. It is idle to blame the government and spare the democracy. If, as the ancients taught, the order of the state is a mirror of the order of the soul, then we need reform of the soul. Thanks for the reminder, Paul, that Globalization--the delusion that human life can best be sustained at an inhuman scale--is a disordered enterprise. It's too bad that its necessity seems to be one of the few things our two feckless political parties can agree on. "Globalization -- the delusion that human life can best be sustained at an inhuman scale." I'm going to remember that one, Chris. Nicely done. "Subsidarity, subsidarity," the mouse croaked. "Our law, here, my dear mouse, is to love thy transnational multicorporational conglomerate as thyself." "But my dear cat," the mouse sighed, "who owns the cheese?" It comes down to the old heresy that human life and the world can be captured by models and equations and abstractions, that the science of man can conquer the uncertainty of the world. The very idea of progress must be re-examined in light of what we have seen. Our technical mastery has deluded us. Our assumptions are undone. I am asking this because I am trying to discern just how far we must understand the rot really goes. Predicting weather with high-tech stuff seems not only acceptable, but downright responsible for farmers and such. But that leads almost imperceptibly to risk-leveling methods of dealing with weather related crop problems, and so on to the whole insurance industry. Personally, I tend in the direction of thinking that modern tech methods in themselves are neutral (in most cases, IVF being a notable exception), but there needs to be a humane understanding of their usefulness. I really don't think that the usury crisis came about because of applying the science of economics to places where the science does not apply, but more, (much, much more) to people just letting greed obscure right action, and letting greedy technophiles sound off in such a way that their audience allowed themselves to forget that tech-speak doesn't tell you what you _ought to_ do, it only tells you something you might do. In the final analysis, people want to enjoy wealth without actually doing the hard work of increasing the wealth in the world. I would not arraign the actuarial science as such, Tony. Or any science as such. Would it be realistic to say that the very act of implementing insurance coverage on a large scale modifies the behavior of the covered persons so that they no longer act in a way that can be insured? I think there is some serious economic research suggesting an unwanted modification of behavior. Moral hazard has received some serious "scientific" economic attention. But more broadly to your (very excellent) question as to "just how far we must understand the rot really goes," I would tend toward the view that the rot is in the human mind, not in the field of scientific endeavor. I might also add that certain classes of science are more ruinous in the hands of certain classes of men. Medicine -- its honor, its prestige, above all its integrity -- must be guarded with care. Other sciences may possibly be less vigilantly guarded. But I think even so abstruse as science as actuarial science has inherently good uses.